Juleigh Ed can be seen performing "ROCKY TOP" in the TV-MOVIE series; BANDIT. Juleigh Ed has won many awards over the years. She has been in many plays as well as performing live all over the USA and abroad! Juleigh Ed loves old and new "Cowboys and Indians" movies! Juleigh Ed is a "cowgirl" herself. A REAL cowgirl! She and her partner, AJ, own a horse retreat called POCO-RHYTHM. 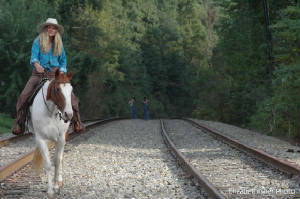 They have cabins that they rent out as well as horses to ride on the trails. If you ever want to see the best sunsets ever, and be the closest to heaven you will ever be, then you need to make a reservation to go to POCO RHYTHM, located on beautiful Burkemont Mountain in Morganton, NC!!! !